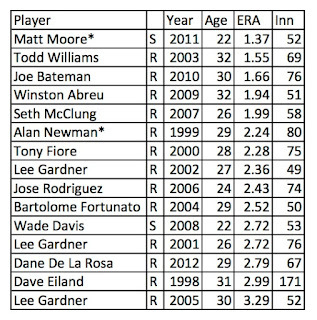 As a followup to Monday’s effort to pick great position players Durham Bulls history, here’s a first shot at looking at pitchers. Remember that we are talking about the AAA Durham Bulls from 1998 to 2012. Note that AAA Bulls history is divided into two eras, so far. The first is the era overseen by manager Bill Evers from 1998 to 2005 and the second from 2007 to today under the leadership of Charlie Montoyo. I started watching the Bulls closely during the interregnum year of 2006 when John Tomargo managed an interesting collection of veterans and hot prospects. The Montoyo era also roughly matches the Maddon era of the Tampa Bay Rays and strong front office leadership down in St. Petersburg. Trying to get a good number to evaluate minor league pitching is hard. In general, they just don’t stick around long enough to build very large sample. Most stats guys don’t think much of won-loss records, and I agree. 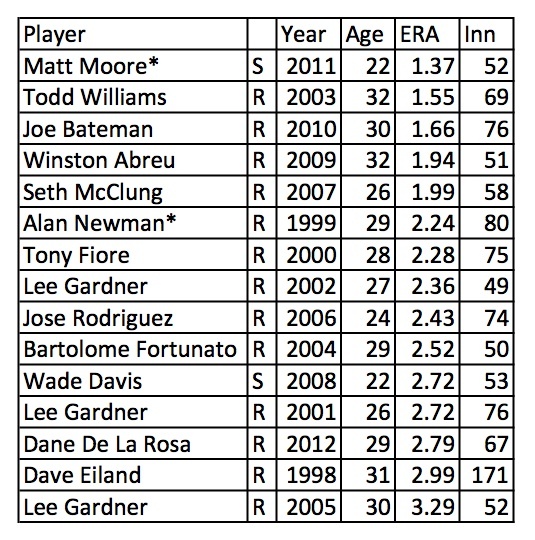 So for the first table I set a floor of 100 innings and sorted by ERA. Pleased to see some of my favorite guys on the list. 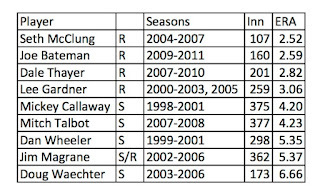 Nevertheless, time in the minor leagues is limited, so the second table set a floor of 50 innings and shows the best ERA for each year. There are a couple of surprises (for me) in the list (I didn’t realize how good Matt Moore was in his brief time with the Bulls). 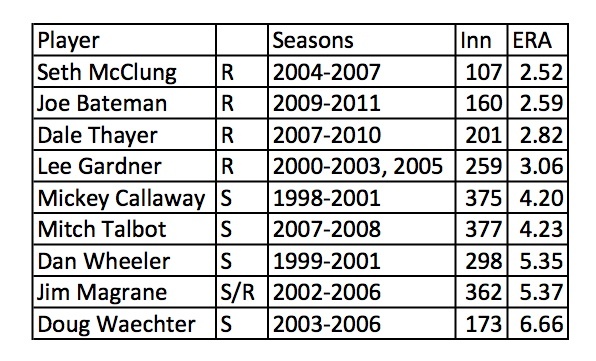 Also notice that reliever Lee Gardner makes the list three times and is on the multi-year list as well. Seth McClung and Joe Bateman also make both lists. And notice the sheer number of innings by Mitch Talbot, Mickey Callaway, and Jim Magrane. Any good stories out there from folks who saw Callaway and Magrane pitch? Next we are going to go back and revisit those position player numbers. Chris D has done some serious digging for us that I’ll be putting up as we wait for Spring. First game at the DBAP in 88 days. I don't have any comments on Mickey Calloway as a pitcher, but I do have an interesting story. I worked as a batboy from 98-00 and I once hit him with a thrown ball square in the back. This was on a start day no less, and to say the least he was not thrilled.